"An easy and delicious curry dish with aromatic spices to warm you up from the inside out. Serve warm with rice or a side of naan bread." Melt ghee in a large skillet over medium-high heat. Add cumin seeds; stir until fragrant and starting to crackle, about 1 minute. Stir in onion, jalapeno pepper, curry, garlic, ginger, and bay leaves. Cook, stirring occasionally, until onion starts to soften, about 5 minutes. Pour tomatoes into the skillet; stir to combine, about 2 minutes. Add chili powder, cumin, coriander, turmeric, and salt; stir thoroughly. Add beef; cook, stirring with a wooden spoon to break up the meat, until no longer pink, about 5 minutes. Reduce heat to low, cover, and simmer until flavors combine, about 15 minutes. Add frozen peas, cover, and simmer until heated through, about 10 minutes. For a thicker consistency, increase heat to medium and simmer curry, uncovered, until sauce reduces, about 5 minutes. Sugar snap pea sauce with seared black cod and strawberry garnish. Substitute the fat or oil of your choice for the ghee if desired. Use a Thai pepper, serrano pepper, or omit the chile pepper if you prefer. 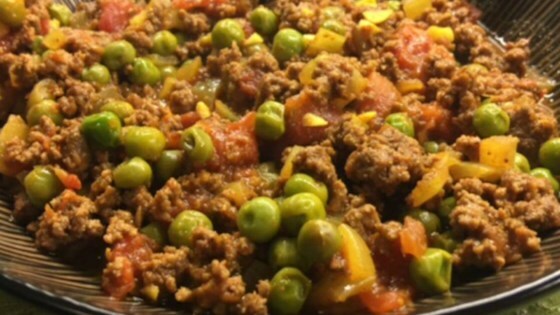 Substitute 1 1/2 cups fresh chopped tomatoes for the canned if preferred. Substitute ground lamb for the beef if desired. Made exactly as described and my family gobbled it up. Delicious. Not hard to make, quick prep. My picky hubby who is not a lover of spices loved this. I'm definitely going to make it again, some time soon. Make it exactly as stated every time. Delicious! It was the best. Family loved it. My son-in-law made a point to tell me he liked it especially. Great recipe.